Click on these "thumbnails" to see enlargements and text. 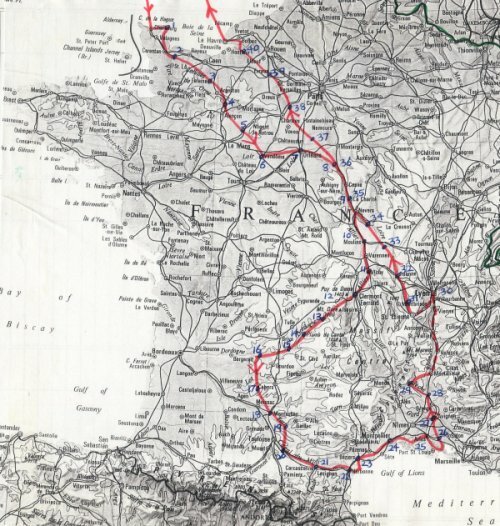 Our route through France to the Med and back again to England. Awoke at 0430 hours and did not go to sleep again. Got up at 0520 hours and set off with our bikes on top of the car to John's mother's flat overlooking Poole Park. Our bungalow was left for Robert and 2 of his girls to use. We then cycled to the "Truckline" ferry terminal. The weather was foggy and warm and the boat left before 0800 hours. We arrived in Cherbourg in warm sunshine at 1230 hours BST. We cycled to Barfleur with the wind behind us and in sunshine. Racing cyclists were going in the opposite direction. We checked into the 2-star hotel, "Le Conquerant" and our evening meal was from "SHOPI". We had a very short walk in the evening due to rain! Bed about 2300 hours, French time. (Cycled ?? miles). Slept fitfully after a mug full of red plonk, although I was tired. It was a bit noisy outside with church bells or the clock chiming on and off! We left about 1000 hours in sunshine after last evening's rain. Much cooler now - vest on! We cycled along "yellow" road parallel to Utah Beach until we reached Ste Marie du Mont, made famous on D-Day. We looked at a museum/shop with American and German war-time items. We bought lunch at a small shop and ate it opposite in the churchyard with a famous steeple. We carried on past Carentan, unfortunately along a main road due to no ferry across a river nearer the sea (Douve Estuary). There were minor roads either side but no crossing! We reached Isigny-sur-Mer ("Mer" was pretty ghastly, being Aure Estuary). The sky clouded over occasionally since lunch stop. We wandered around in the early evening and had superb meal in a 2-star hotel. There were mostly English-speaking people there. Bed about 2300 hours in zero-star "Hotel ??"! (Cycled 37 miles). Slept badly, in our 4ft so-called double bed until 0100 hours. I then moved to the empty room next door and "slept" in the unmade single bed there! I was awoken at 0700 hours by frantic church bells. I tidied the bed etc. and went back to John! In cold but sunny weather we cycled to Caumont-sur-"HILL", where it had become cloudy and cold! We had our lunch here. We then continued to Thury-Harcourt, where John's derailleur gears conked out! The freewheel had collapsed into little pieces! A bike shop was just a few yards away where it was fixed - sort of!!! We continued to Falaise and checked into "Hotel St Gervais". The man at the bike shop here is going to fit more new cogs. I bought a hard-ish glasses case and we had pizzas for our evening meal. We had a quick walk before bed at 2315 hours. (Cycled 62 miles). Slept better. I awoke at 0700 hours to church bells yet again! (Ave Maria - modern version!) We had an easy morning walk around an allottment area - very picturesque. Beautiful sunshine and getting warmer. John's bike was ready earlier than midday and now has 6 gears, which are working properly. John "wrote off" 250 francs spent in the first bike shop! We started cycling at 1130 hours and our lunch stop was at Trun, where we had stayed the night on a previous cycling vacation in 1988. Supermarket lunch again. We continued to Sees and arrived about 1600 hours. We strolled around until about 1900 hours. We showered and then ate late in "The Boomerang", hotel/restaurant (cheapo) run by an Aussie. Bed at 2330 hours. (Cycled 32 miles). Awoke at 0745 hours. Church bells did not start until 0800 hours! I awoke in the night and tossed and turned for ages. We had to wait ages for our breakfast served, eventually, by a sickly-looking girl. She had to serve 2 English couples + 5 kids who were together. We left at 0930 hours in sunshine and cycled to Mamers for lunch, which we ate in the square. Weather is getting warmer as we head south. My chain came off at the back, yet again, in the morning! We had a rest in the afternoon in a lovely wood. There were more cars around in the afternoon. Continued to La Ferte-Bernard but a 3-day fair made all the hotels full but after much searching we found "Hotel du Stade" in a back street. The man on the desk at first said, "Complet!" but later changed his mind! (We left the previous "territory" at Mamers). In the evening we looked around the fair and then had a meal in the pizzeria. Bed at 2230 hours. (Cycled 50 miles). Slept after 0100 hours after moving into the spare single bed because I could not sleep due to dogs barking and John clocking up the "Z's"! We were served a "cheapo" breakfast by a cheerful, hyperactive lady. We left at 0900 hours along "yellow" roads until we reached St Colais by a canal below the street level. We had an early lunch here. We chatted to a 74 year old lady, who spoke English. Her father was English. Afterwards we continued for a while until we found a shady resting place. There was a fair amount of traffic about and the shops appear to be closed today. After about 1 and a half hours we continued along slightly less busy roads until we reached Vendome. We found "Hotel du Chateau". We had an evening walk around town and then eats in another "Mr Jipsy" pizzeria (French-type "Little Chef"). This town is on the River Loire. Sundays and Mondays most shops are closed. Bed 2300 hours. (Cycled 41 miles). Slept fitfully, the room was overlooking crossroads and "Mr Jipsy". Up at 0715 hours. We left at 0900 hours in an easterly direction. The countryside was like the Prairies of mid-west USA and flat. The weather became cloudy. We passed through a nice forest before St Laurent. We did not find a food store until Hiusseau at nearly 1230 hours. We had to cycle like "bats out of hell" to make the shops before they closed - that was the last 3 miles!! We arrived at Orleans about 1500 hours and checked into the 2-star "Hotel Sanotel", which was very expensive for us being opposite the Loire! We went for a walk and a toy-train ride, followed by a pizza and another walk around Orleans. There was too much traffic but old Orleans was nice. Bed at 2330 hours. (Cycled 45 miles). Up at 0715 after sleeping quite well in silence due to the double-glazed windows! We trundled off to the bank to change some travellers' cheques. The cobbled area in Jeanne d'Arc Square looks like a pedestrians only area but it ain't, making it very dangerous for strangers! We cycled along the Loire, on the levee where possible to Chateauneuf where we bought lunch and sat eating it by the river. Weather sunny but not too warm (vest on!). We continued along the river but there were not so many suitable levees this time - although the scenery was very nice in the vicinity of the nuclear power station ("Super Phenix") before Gien. We met an elderly, small, fit Swiss man going towards Orleans. We arrived in Gien at 1600 hours and found the Hotel "La Belle Epoque", with the help of Syndicat Initiative, out of the town centre. In the evening we went for a walk and ate at a hotel downtown. We chatted to a middle-aged English couple at the next table. The meal was good. It was very flat cycling today. The traffic is horrible here! Bed 2315 hours. (Cycled 51 miles). I slept until very early morning and tossed and turned until I got up at 0715 hours. Weather sunny but cold. We set off about 0930 hours but it soon started to cloud over. We cycled along the Lateral Canal de Loire on and off until we got to Cosne-sur-Loire. Awful traffic! We had to eat cakes for lunch as we could not find a food shop in time, before shops closed at 1230 hours. We continued along the Loire as the weather was getting greyer until we were rained apon, about 3 miles from La Charite-sur-Loire. I should have put on my orange over-shoes the same time as my cape because my right foot got wet. We checked into "Hotel le Berry" just before 2 bridges into La Charite. We had a walk, I bought some soap and we ate at our hotel and then we had another walk down on the river bed (sand) and in town. The weather seems to be getting worse rather than better! Bed about 2300 hours. (Cycled 47 miles). I slept fairly well but awoke a little early. We set off at 0900 hours in cold sunny weather. Arrived at St Pierre at 1230 hours and was just able to buy lunch at an "alimentation" that was about to close late! We ate in a local "park". By now it had clouded over. The only shelter from the cold air was in the unisex lavatory! We continued along a "green" "white" road and the countryside was now looking very English, with pastureland and trees instead of crops. We arrived at Moulins about 1615 hours. Luckily it did not quite rain! We checked into "Hotel Taverne de France" - a real cheapo dive! We had a walk in the evening and a meal at "Le petit Auberge" instead of a place near our hotel that looked even more seedy than our hotel! Bed about 2300 hours. (Cycled ?? miles). I slept well but awoke early. Up at 0715 hours and we left at 0900 hours. Cycled along the N7 (main road) for a short distance and then turned onto minor roads until almost at Varennes. John got a puncture at Le Loup - before Varennes. Back onto main road. The weather was cold and sunny but warmed up by lunchtime at Varennes where we ate our lunch in the square. We carried on along mostly minor roads in the afternoon but we had to backtrack in order to reach them. It is slightly more hilly now and I can see hills in the distance beyond Vichy. The countryside is getting prettier and we arrived at Vichy about 1500 hours. Checked into "Hotel Athenee" - cheapo!! I did some dhobiing and then we walked around town. Ate a good meal for 57 francs and later we got lost but John's compass got us back "home"! We had walked "miles"! Bed 2245 hours. This place is a very posh spa town! (Cycled 39 miles). I could not sleep at first due to loud voices downstairs and thumping up and downstairs by these same loud voices! After midnight I went down and sorted them out! We set off at 0930 hours on mostly "white" roads. Sunny weather and very cold first thing but it warmed up a bit later. It is getting hillier and the Massif Central is getting nearer. The countryside is starting to look North Italian, houses also. We stopped for lunch at Maringues where there was a German band playing in the square. Maringues is twinned with a German town. We ate our lunch by a pond where tables and chairs awaited our use. Continued along mostly minor roads in the afternoon to Clermont Ferrand but continued straight through and very much up to Royat. This is the Canford Cliffs (posh area!) of Clermont Ferrand! More spas! We checked into "Auberge l'Ecu de France" and bought "Mars" bars (John) and "Bounty" bars for me for tomorrow. Ate in the hotel restaurant which was very expensive and had a quick walk. Bed 2245 hours. (Cycled 47 miles). I slept alright until about 0500 hours and got up at 0700 hours. Comfortable bed. Weather sunny but not quite so cold as yesterday. We left at 0900 hours and started up the main road and then up the "white" road to Col de la Moreno (1065 metres).I was pushing my bike most of the way up! The rest of the journey was on main roads. Very attractive scenery with lots of deciduous trees, oak, ash, birch, sweet chestnut etc. We were now in the Auvergne and saw chestnut-brown and Friesian cattle with bells on!. No crops but grazing land and land covered with trees, mostly deciduous but with some coniferization on the hillsides. After the col we had a big downhill. We had no lunch stop, just drinks in a bar in Laqueville (1000 metres) and eating our chocolate bars along the route. Some ups and downs later we reached Veillac where we checked into "Hotel la Maison Blanche" at about 1615 hours. Cheapo meal at our hotel and we had a walk along the lane in the evening. Bed 2300 hours. (Cycled 46 miles). I slept the best so far on this vacation! Awoke early but went back to sleep. It is nice and quiet here being a country hotel. Good view of trees, fields and cattle with bells in the distance. We set off at 0915 hours to Bort sur l'Orgues (downhill). I cashed a travellers' cheque. We continued along main road until we reached Mauriac with many ups and downs. John bought our lunch because I got there too late (after the shops had closed). I was shattered! We found some grass where we ate our lunch. A mother took her 2 children to school, I suppose, in separate car journeys, each taking only 5 minutes! Lovely sunny day again. We continued along "yellow" roads to St Privat, where we managed finally to get a room in the 3rd hotel we tried ("Hotel ??)! I tried unsuccessfully to buy Baby Oil in 2 pharmacies today. We had a cheapo meal in another hotel and I used the "squattoir" there! Beautiful scenery with lots of deciduous trees and deep river gorges. Bed 2230 hours. (Cycled 42 miles). I slept fairly well. We ate a large breakfast and set off at 0900 hours. It was downhill to Argentat. Weather cold but sunny. Joined "white" road along the Dordogne, which was fairly narrow to start with and there were many walnut groves. We chatted to an English couple who had friends in Worth Matravers. These friends lived in the house overlooking the start of the path to Seacombe. We ate lunch by the river at Beaulieu - "olde worlde" village. We chatted to a Dutch couple in Carennac. There were many cycle tourers about here. The valley was becoming wider. We arrived at Gluges at 1600 hours and checked into "Hotel ??". The main village is up against a rock face. There are many rock faces around here so it is very picturesque. Later we went for a walk and had an evening meal. Bed 2230 hours. (Cycled 44 miles). I slept fitfully. The weather was sunny and cold. The breakfast was the worst so far! We left at 0915 hours along "white" roads with very attractive scenery. It got very warm before lunch and I took off my vest! Our lunch stop was at Souillac which was very tourist orientated and full of "grockles"! (Cycled 18 miles). We ate in the "park" along main street criticising the traffic! Loads of trucks and many British cars! We continued mostly along "yellow" roads and even some "red" ones. At 1600 hours we could not find a hotel with an empty room so we continued along a "white" road to St Cyprien where we checked into the 2-star "Hotel de la Terrasse" about 1730 hours. It had been very nasty cycling on traffic-ridden hot roads. Soon it started to rain! We ate in the hotel and had a walk around the attractive old village. Bed 2315 hours. (Cycled 53 miles). I slept badly! It was hot in the room as we had to shut the window and shutters and there was someone snoring next door! A grey day and it rained before our lunch stop. We left the Dordogne mid-morning and headed south. Had lunch at the medieval village Monpazier where I located the WC - a "squattoir" (also known as "pull-and-run"!) We continued along a "white" road in the afternoon along the Lede valley with lovely deciduous woodland. Saw some deer. We went through Fumel (ghastly) and on to Tourron (on top of a hill and very spectacular). There was no accomodation that was in working order!! Now it was very hilly on "yellow" roads. We arrived at Montaigu de Quercy and found a room about 1715 hours in a hotel with stone walls and "secret passages", maybe! Had a walk and ate evening meal in the hotel with an elderly-ish American couple, who had lived 13 years in France. Another walk and bed 2330 hours. (Cycled 53 miles). I slept fairly well but awoke very early. We set off about 0915 hours. The agricultural equipment fair was set up again from 0730 hours with music from loudspeakers! The weather was sunny but misty. Very hilly cycling in the morning. We reached Lauzerte which was another medieval village on top of a "mountain". Continued to La Capelette for an early lunch. After lunch we had a long downhill ride but gradually the hills got less long. After La Francaise they petered out altogether. Now we were riding through an area of apple orchards etc. We cycled along a "white" road to Montauban by the River Tarn. We found a hotel via the Syndicat Initiative. We chatted to a "bum" from Bristol, who had been in France for 2 and a half years, before we checked into "Hotel du Commerce". Later we walked around the town, ate a good meal in a pizzeria and had a walk around a fair. Bed 2315 hours. (Cycled 35 miles). I slept fairly well until very early morning. The disco packed up at about midnight and the person(s) above finished crashing about roughly the same time! We left about 0930 hours with the weather looking thundery. It started raining and we sheltered from the storm in Corbarieu, in front of the public wash house. We sorted and oiled our bikes - 1 of the spokes in my back wheel had busted so John fitted one of his spares. I squittered in the "squattoir" behind our shelter! The problem was the result of all the salad I had eaten in last night's pizzeria. Eventually we carried on to Villebrumiere where we bought lunch. Finally, the sun came out and we cycled along "white" roads to St Sulpice. "Hotel de la Gare" appeared closed so we checked into "Auberge de la Pointe". The chef/owner was quite a character. There were lots of "diplomas" pinned up in the lobby! We walked into the village and had a meal at another hotel. The traffic here is awful. Bed 2330 hours. (Cycled 31 miles). I slept badly! We put the mattress on the floor due to the "foot-end" on the bed! No good for poor John who is 6 feet 4 and half inches tall and the standard bed length being about 6 feet! Room cost 80 francs, awful traffic and staff running up and down stairs (no carpet) until about 0100 hours. The stairs were outside our room - hence it cost 80 francs! I said, "Quiet please!" to noisy Germans next door and they were quiet! We set off about 0930 hours and John waved "goodbye" to Monsieur Jean-Robert Choliet, the chef/owner, who had computerised the whole hotel including the staff! A grey day and it got worse! It rained on and off all the time we were on the road. "White" roads all morning. We had to eat in a bar in Caraman as all the shops are closed. (John had raced ahead to no avail and lost me - the swine!). This town is on top of a hill as most of our French lunch places are these days! After lunch we cycled on "yellow" roads and the hills got less and less until we reached Villefranche. The scenery was less interesting - no hedges, crops again and few orchards. There was a good choice of 2-star hotels in Villefranche. We checked into "Hotel du Lauragais". We went for a walk later and had cheapo meal. Bed 2230 hours. (Cycled 40 miles). (5)road we were cycling on, which was above the other 4 means of travel. We sat beside a covered market area for our picnic lunch. We then continued along a "white" road, which was straight, (in sunshine since lunch). The traffic increased the nearer we got to Carcassonne. The Canal du Midi appeared blocked, just before we reached Carcassonne, by an old barge. We checked into "Hotel de la Cathare" (1-star). Later we went off to the famous castle (Cite). The most impressive castle in the world! Unfortunatley, traffic was allowed on the narrow roads inside the walls! We had a cheapo meal (50 francs) and then back to the hotel. Bed 2300 hours. (Cycled 43 miles). I slept much better but still awoke early. (The young English couple in the next room were laughing and talking last night, so I did my Wimbledon "QUIET PLEASE!" and they were! It was after 2300 hours.) We set off at 0900 hours "zigging" and "zagging" to avoid the "red" roads! There are many vineyards in the area with much grape picking with the constant smell of fermenting grapes! Some areas had grape-picking machines. The weather was warm and sunny all day but now the sun did not seem so strong. These areas appear to be run by a Workers' Co-op. We ate our lunch at Lezignan. We continued cycling along more straight roads after lunch alongside more vineyards. We went along the Canal du Midi some of the way. The canal here is quite useable with one or two boats moving. We sat and watched a man operating a grape-picking machine and had an altercation with a young bad-tempered woman who was about to reverse her car into us and our bikes!! We were sitting beside a farm track. We arrived in Narbonne and checked into "Hotel ??". Later we went for a walk, ate pizzas and had another walk along the canal. We only saw one or two men about, mostly. Bed 2345 hours. (Cycled 47 miles). We had to move, last night, to another room as original room had a water leak! I slept fairly well in a separate bed and awoke not quite so early. We were not charged for using the extra bed! We left about 0900 hours and got lost getting out of Narbonne, which is a bit seedy! We finally found the correct roads to Narbonne-Plage and had to pass over a range of scrub-covered hills called Montagne de la Clape. The sky was very grey and it was trying to rain all morning. We arrived at Narbonne-Plage for an early lunch and a PADDLE in the MEDITERRANEAN!! 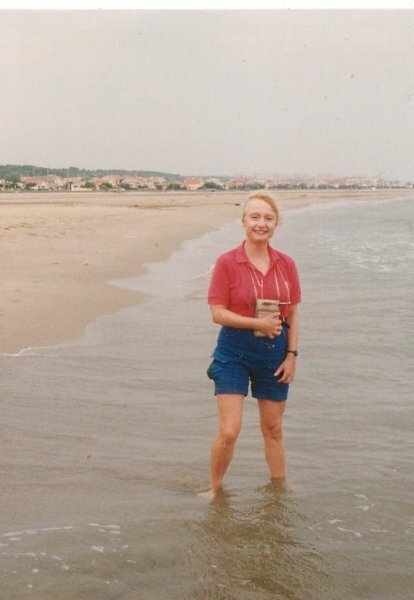 NARBONNE PLAGE.Rosie paddling in the Med. She got all the way under her own steam! Hideous appartment blocks everywhere - all the same sand coloured! There were only a few people on the beach walking - too cloudy and cool!! After lunch we turned "left" and cycled to St Pierre-sur-mer and then headed inland and the sun came out! Now quite hilly in places. At Lezpignan there were grape dregs (awful pong!) running in a ditch. This came from a wine Co-op "factory". The grapes are ripe around here. We arrived in Beziers - very attractive town, terraced buildings and on top is St Nazaire Cathedral. We checked into "Hotel de l'Angleterre" (1-star). Later we had a walk, cheapo meal next door and another walk in the evening. Like last night, no-one was out walking but there was activity in the bars etc. There are many Arabs here. I washed my cycling shorts. Bed 2315 hours. (Cycled 32 miles). I slept well - I think! The best hotel so far, all things considered - quiet, comfortable and good position. We left at 0915 hours but got horribly lost leaving town! There is lots of industry outside Beziers to the east. We had to cycle on a main road for a while to Vias, luckily with a tail wind. It was then "white" roads to Pomerols and we had our picnic lunch there. The weather became more windy and less sunny and it was heavy going after lunch with mostly a side wind but also a head wind. We were on the longest newly-gritted and tarmac'ed road I have ever cycled on with a long slog over an unattractive range of scrub-covered hills, still with a side wind. MONTBAZIN. A typical road in the S of France. The shade is very welcome. Hideous new developements scattered about and the so-called "white" roads got worse with traffic! Some sections had a cycle-track, though. Finally we hit Montpellier - a heathen-looking place with its own "Skid Row". AIDS looks rampant at every street corner! The ancient parts of the city are all narrow streets and very interesting but some weirdos around! After checking into "Hotel Nova" we went to a pizzeria and then for a walk. There is a large Arab population here and beggars in "Skid Row". I am not impressed with the South of France by what I have seen so far! Bed 2330 hours. (Cycled 55 miles). I slept fitfully. Weather warm and sunny. We left at 0915 hours and got out of Montpellier easily! Cycled on "white" roads to Lunel which was only a small place but with awful traffic! We arrived at St Laurent and just outside we sat in a vineyard for some shade to eat our lunch. The grapes were rotten! Until now we had had a tail wind. The wind seemed to get stronger after lunch (from the west today). There are many bayoux around these parts. 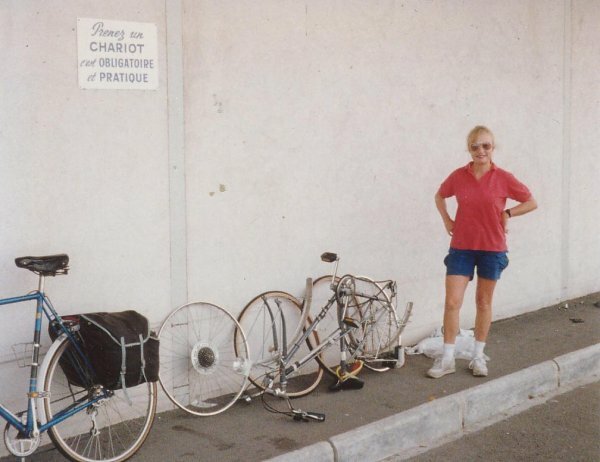 We cycled mostly on "white" roads in the afternoon and crossed the Rhone-Sete Canal a few times. The weather is much warmer again today. We checked into "Hotel ??" in St Gilles. Had a walk, wrote cards, ate cheapo meal in the hotel restaurant and had a second walk on the canal path. Bed 2345 hours. (Cycled 43 miles). I slept OK on and off. I think I heard people getting up in the middle of the night! The weather was cloudy and warm and we left about 0930 hours. We crossed the "Petit Rhone" and headed towards Etang du Vaccares. We cycled around this lake which is the main part of the Camargue Nature Reserve. There was not too much traffic in the morning and we saw very few birdwatchers and cyclists, for a Sunday. We lunched in Salin-de-Giraud as we just caught the "Co-op" open to buy food. This place is full of salt producing industry - salt flats everywhere. The wind sprang up again. We continued to Arles along a boring "yellow" road with the wind sometimes in our faces. This road had more traffic on it. As we neared Arles we came upon the levee alongside the Rhone. We checked into the 2-star "Hotel Diderot" - rather gloomy as there was no light! We went for a walk and then had a cheapo meal in a "soup kitchen", followed by another walk. There are historical sites in the form of a Roman theatre and a mini-collosseum where the CORRIDA are held! In France there are also rooster-kicking contests! Bed 2250 hours. (Cycled 55 miles). I slept fairly well although I woke a couple of times. We left about 0915 hours in bright sunshine but a head wind. Crossed over the "Petit Rhone" and cycled along the D15 to Beaucaire on a very attractive "white" road. Beaucaire is where the Rhone canal meets the Rhone. We crossed over the Rhone until we reached the bridge near Aramon. Nowhere to buy something to eat. Until here it was very nice due to lots of foliage by the roadside. Along the Rhone are levees on either side to stop the river from going where it is not wanted. There was much movement of grape-trucks and we eventually arrived in Avignon via a "yellow" road which was not very pleasant. We chatted to a retired American couple (cycle-tourers). The wind was quite cool now. We checked into "Hotel Mignon" at about 1330 hours. We dumped our gear and then went to the railway station to check the trains after eating snack pizzas across the road. We ate our evening meal in the "Place de l'Homme" - on the pavement. Young Germans at the next table smoked 5 cigarettes each!! We then walked to the Pont de St Benezet - the bridge that goes nowhere! The street theatre was very good while we ate our evening meal! The TV Channel 13 had cable BBC 1 TV (south-east) with the same boring news as usual! The comedy programme "'Allo 'Allo" was on with "Smallhausen" disguised as "Field-Marshall von Krackenfahrt"! Bed midnight. (Cycled 30 miles). I slept badly due to the awful traffic below our window, which went over a loose manhole cover! The double-glazing was of a useless type, being extra glass fixed over existing glass - the wooden frame around the edges stayed the same! A cold day with no sun to speak of! Vest and sweater on!! We cycled, along an island in the Rhone, out of Avignon until we reached a dam where we crossed the river. We had gone along very minor roads for quite some way until then. We crossed the river again at Roquemaure and again at Caderousse. Lunched at Codolet (what we could get - which was not much!) We passed the CEA (Phenix) site at Marcoule. Arrived at Pont St Esprit and checked into a Motel (??). Our bikes were outside so we cleaned them - no chance previously! I bought some "Emoform" toothpaste and "Mustela" lait de toilette, both for the second time. We had an evening walk down to the bridge and river and ate a good cheapo meal at a creperie. The temperature seemed a little warmer now. Bed 2245 hours. (Cycled 33 miles). Rain fell in the night, knocking conkers off trees onto the roof of our "motel" room. There was an attractive yard at the back of the "motel" restaurant, which our room looked onto. I slept fairly well - I think. We left at 0915 hours. The weather was cold and grey but soon became brighter. We cycled on "white" roads to St Martin, start of the Gorges d'Ardeche. The weather became sunny and warm and we cycled up the winding road, all ups and downs! Along the route we chatted to 3 separate English couples. The river is very popular for canoeing for beginners because of the slow moving water with huge meanders for interest. There were only "grockles" driving along this road so it was not too busy. Most of the ups are along the first third of the way. Checked into the 1-star "Hotel des Touristes" near Pont d'Arc. This is just down the road from the hotel. We had a lovely swim in the area of the arch, the best river swim we have ever had! John had another puncture, his third! We had our evening meal at the hotel, which was very good. With it we had 1 litre of red "plonk"! Had a walk down to the river afterwards in the dark. Bed 2300 hours. (Cycled 30 miles). I slept fairly well, I think. 3 Frenchmen next door were very quiet - maybe there were only 2! I heard a robin singing a lone dawn chorus. The first one I have heard in France so far! John found his front tyre had a puncture (the repair must have been faulty!) He used his new inner tube. We left at 0915 hours in cool, grey weather. The valley was mediocre soon after Pont d'Arc and Vallons was a dump - I am glad I suggested we check in a hotel where we did! It became windy as soon as we came out of the gorges. We lunched in yet another Villeneuve and the sun came out suddenly! There was a "demarcation line". John had ANOTHER puncture in his back tyre, his fourth actual puncture! He used my spare inner tube as he had no unused ones of his own. We had to use "red" roads to Montelimar, with a long downhill into Le Teil before crossing the Rhone. I had to walk because of the traffic and the awful wind (the MISTRAL) blowing down the river!! John bought 3 inner tubes and at 1657 hours we caught the train to Lyon. Usual horrific problems with getting bikes on French trains! I + bike nearly got left behind! A 2 hour train journey, stopping at every station before we reached Lyon, which was a frightful place, at 1900 hours. We checked into the 1-star "Hotel Geneva" - the noisiest yet as we were eye-level with the elevated rail tracks! We got the full sound effects of the railway station! We had gone from the BEST situation last night to the VERY WORST tonight! It was all John's fault going for the first cheapo hotel we found; we had cycled 3 sides of a square in the dark! We ate a meal at a pizzeria with 1 litre of "plonk" down the road. Bed 2245 hours. (Cycled 41 Miles). I slept badly! I awoke about 0300 hours with indigestion. The trains were still going up and down. Frightful racket! Eventually, after ages, I went back to sleep with a pillow over my head! No hurry in the morning. We had to catch a train to St Etienne at 1050 hours. Weather sunny and cold. As the accompanied bikes travel free one does not get much help from the railway staff! As our train left Lyon we could see how near the station was to our hotel room! It was still cold when we arrived at St Etienne. Hell of a job getting out of St Etienne due to the usual problem - all road signs in big towns lead to motorways! We managed to get food from a store just before closing time. After lunch we headed toward the Loire and crossed the river to St Cyprien and cycled along "white" roads to almost Montrond-les-bains. Heaven! We crossed the river again and checked into "Hotel Welcome et Central", wrongly placed at crossroads of busy roads - one being the Paris road. Cheapo rooms at the front, of course! We had a walk about town and a snooze down by the river in the sun under the road bridge until John woke me! We had another walk to look at the closed castle. We ate a pizza with 75 cl of red "plonk" in the evening. Bed 2230 hours. (Cycled 25 miles). I actually slept well until about 0545 hours. We set off about 1000 hours after shopping. Weather cold and sunny and I wore my pink cotton gloves for the first time for cold weather not sun! With sun-block cream I do not need the cotton gloves. We cycled along heavenly "white" roads to St Georges. No food shop so we made do with buns from a patisserie. We ate them just above the Loire where it now passed through a narrow gorge. Here is the start of a reservoir and the different levels could be seen. Now the terrain was all ups and downs. Just before Roanne is the dam that caused the reservoir. There was some evidence of protest about the dam-building here! We found the 1-star "Hotel Nouvel" (Bar-Hotel - no restaurant). Later we went shopping for more soap and shampoo. We ate a cheapo meal at a hotel down the road. I think they will give us breakfast tomorrow as it is Sunday and we will not get fed at our hotel! We had a quick look at the railway station across the road. Bed 2300 hours. (Cycled ?? miles). I slept fitfully due to mosquitos in the room biting me and making me itch! I was also warm so that did not help. Woken by John at 0700 hours but it really was 0600 hours as the clocks had gone back last night! We ate a good breakfast at the hotel down the road and we set off at 0900 hours (BST). It was very warm and cloudy with a tail wind. 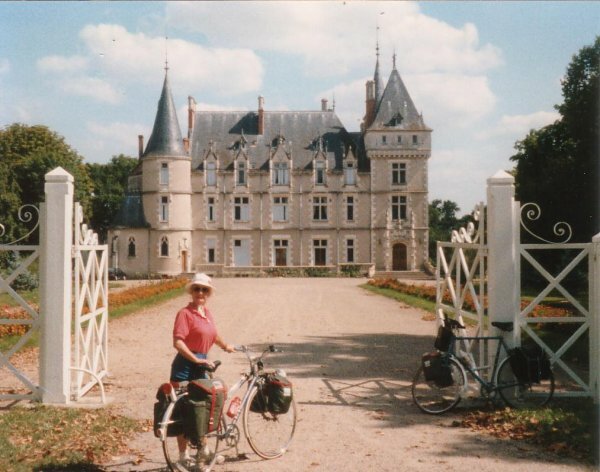 We cycled along "white" roads, along the canal or the Loire and the terrain was mostly flat. We reached Marcigny, where John changed my tyres over and we lunched in the town "park". It rained on us briefly. Some fellow had also got married and he and his friends were drunk and were singing "Ave Maria" and "The Marseillaise" etc.!! We continued along similar roads in the afternoon just being missed by a thunderstorm. Charolais cattle everywhere. The sky cleared but we decided to stop at Digoin due to it being Sunday, with the problems of closed hotels! John had a puncture in his front tyre. We checked into the 1-star "Hotel Modern" near the railway line!! We had a walk down to the river where the canal crossed over it. A barge came very slowly across the bridge. We ate a 50 francs meal at our hotel. A quick walk and then bed at 2300 hours. (Cycled 39 miles). I slept until about 0400 hours only and got up at 0700. Grey skies and rain! We set off between the showers along the lesser of 2 main roads along the Loire to Diou. Rain fell on and off where we crossed the ??. Cycled along "yellow" roads to Garnet for lunch (spartan!) - only one very small store open being Monday! We ate our lunch in a bus shelter. It stopped raining and we continued along a very straight road but soon there were more showers. We arrived at Decize about 1500 hours and had a problem finding a hotel open! Eventually, we found the 2-star "Hotel les Capucines". It appears some hoteliers close in October for their annual vacation! We had to take a 170 francs room in the "Annexe" due to the cheapo 85 francs room in the main building having a footboard! (The cheaper the room, the more likelyhood of a footboard - old bed!). Decize has 6 bridges over 5 waterways, including the Loire, both old and new + 1 over the railway line + 2 over the Lateral and Nivernais canals. The TV in our room has all rubbish on all channels! We had a walk to find bicycle shop(s). We ate a meal from the 50 francs menu at our hotel and walked to the railway station afterwards. Bed 2315 hours. (Cycled 46 miles). I slept fairly well for once! A solid mattress! Foggy day. John bought a new front tyre and put it on his bike while I cashed a travellers' cheque. I had to go to the Credit Agricole bank as the computer terminal had conked out in the Credit Lyonais bank! We left finally at 1000 hours with a tail wind and a flat "yellow" road to Nevers. John bought another tyre, this time for his back wheel in the size he wanted and put it on while I searched for food. John thought I had done a "Captain Oates"! Lots of boulangerie-pattisserie establishments but only one food store a fair distance from the bridge over the Loire where I had left John. We ate our lunch by the river. We continued after lunch along "white" roads and the sun came out. We passed where the River Allier flowed into the Loire and eventually we came to the cutest little village with the cutest little railway station at Tronsanges! Finally along a main road to La Charite-sur-Loire and checked into the same hotel as we did travelling south but a different room. We went for a walk and ate a very good cheapo dinner at the hotel. Had another walk by the river near hotel. John bought a typical blue and white French house number plate. Bed 2315 hours. (Cycled 47 miles). I slept quite well and got up at 0700 hours. There was an awful racket in the hotel from about 0645 hours! It was sunny first thing but clouded over soon after. We left about 0930 hours after a roughly produced breakfast. I had to ask for butter and jam to go on the pile of croissants plonked on the table! We cycled along the Lateral canal on the left bank. At Sancerre the road was blocked ("Route Barree" sign) by tree-felling of poplars alongside the road by the canal. We lunched at Beaulieu in a bus shelter as it looked like rain. Continued after lunch but I developed a slow punture (back tyre) crossing a bridge over the canal after passing through Chatillon. Later, there was a marvellous Victorian canal bridge over the Loire and a continuation but less exotic one over the road. 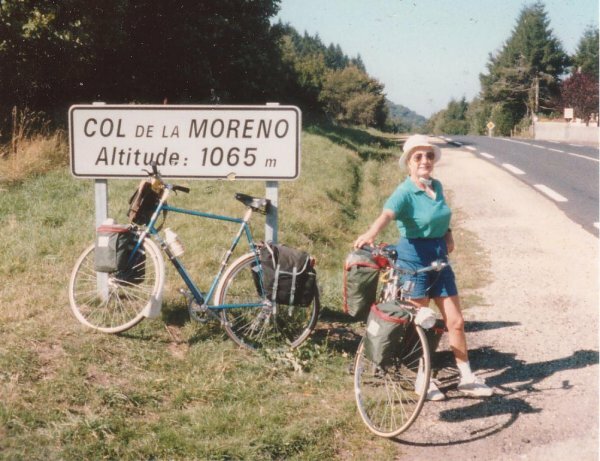 We chatted to a Canadian cyclist who was youth-hostelling mostly in France. On arriving in Gien we checked into "Hotel le Cerf". Later we walked over the bridge before eating a cheapo meal of "fish and chips" in our hotel restaurant. There was horrendous traffic on the other side of the river as there was no by-pass! "Our" side of the river was much quieter - we should have stayed on this side when we spent the night here on our journey south! This place is "wedged in" between 2 nuclear power stations!! Bed 2300 hours. (Cycled 45 miles). I slept fairly well again. Miracle! There was an awful racket from about 0645 hours just like our previous hotel! The breakfast was a bit spartan! Weather was sunny and cold and we set off at 0915 hours. Steam rising from the nuclear power station downstream. We cycled through the edge of the Forest of Orleans. We arrived in Bellegarde at 1150 hours and ate our lunch in a rose-filled park by a Donjon with a moat. We sat on a wooden bench (everywhere in France there are concrete benches!). After lunch we cycled into a head wind with more clouds now along dead straight roads in dead boring Kansas-type country, with what looked like wall-to-wall turnips being harvested!. We arrived in Pithiviers and I was told by the female owner/receptionist at 2 hotels, by the railway station, that they were full. I did not believe this as this place is famous for nothing but turnips! A third hotel person said "non" (? full, or not running as a hotel any more). The fourth was the 2-star "Hotel ??" which accepted us. This was the poshest and expensive for what it was! We went for a walk and had a meal at our hotel because we could not find a pizzeria. After our meal we had another short walk and found a pizzeria just around the corner from our hotel! Bed 2315 hours. (Cycled 45 miles). I slept fairly well - yet again! I opened the window this morning and there was an awful smell of traffic fumes - a common problem with most of our rooms because they were in towns! Breakfast was a bit small again and we left at 0930 hours in sunny but cold weather. Deadly boring wall-to-wall ? turnip countryside until lunchtime at Angerville. There was a gradual advance of the cloudline from the north during the day. John had another puncture in his back tyre by the TGV railway line near Auneau in the afternoon! Still the same Kansas-type countryside but now with a cross or head wind. We now followed a small river valley which was attractive but "turnips" were still away to the left and right! Arived at Gallardon but the only hotel - "de la Gare" said they were "Complet". I reckon, maybe, now it is October they cannot be bothered - at least in this case, as the owner never saw us because the young girl serving in the bar went away to ask him/her. We had to cycle on to Maintenon. We found 2 hotels, one cheapo and the other expensive, both closed until 1800 hours. The elderly lady at the Syndicat Initiative 'phoned many hotels outside Maintenon - but no luck! Finally we were able to check into "Hotel ??" here in a 220 francs room. I had to buy a warmer headscarf as my silk one was no good in cold weather. We had a pizza and wine across the road and had a short walk before bed at 2245 hours. (Cycled 51 miles). I slept fitfully. We set off at 0930 hours in grey and cold weather. I wore a pair of tights under my shorts and had 2 sweaters on for the first time! We cycled along a "white" road along the l'Eure valley - very pretty with many small hamlets along the way with lots of vegetation. Just before lunch the sun came out and we ate at Marcilly. After lunch we headed out of the valley and the scenery became more open but without "turnips"! It was not quite so flat and was more wooded, although still no hedges. Finally we reached Evreux, a fair-sized town at the bottom of a hill, having passed through some villages. Checked into the 1-star "Bar-Hotel du Beffroi", the first hotel we arrived at with no problems. We had a problem finding somewhere suitable to eat and ended up at a pizzeria. Lots of noisy traffic, especially motor-bikes. This is another place where the evening meals are expensive or one is left with cheapo pizzerias! Bed 2330 hours. (Cycled 47 miles). I slept fairly well. What is "bed foot-end" in French? Is it "bout de lit"? Breakfast was next door because it was Sunday. We set off north uphill (Evreux is in a valley). It was cold and sunny but it became cloudier later. There were lots of men shooting in the fields accompanied by dogs (being Sunday) and there was some evidence of "turnip" fields. As it was cold and cloudy we lunched in a bar in Brionne. This was a "rip-off" as it was 50 francs for 1 course which was small and boring but hot at least, unlike the room where we ate which was cold and unwelcoming. The lunch, stew, was defrosted in a microwave oven. After lunch we followed the River Risle which was very nice. I put on my tights and second sweater as the sun had gone. There were lots of half-timbered houses with thatched roofs - looked almost English, also the vegetation looked very English now. We arrived in Pont-Audemer about 1500 hours. Many hotels were closed, because it was Sunday maybe, but we found the "Auberge du Vieux Puits" which was a 17 century half-timbered building. Our room was in an "outhouse" which looked like it would topple over and was all nooks and crannies! The Patron and his wife spoke perfect English! We went for a walk around the town. Many old half-timbered buildings with alleyways, old mill buildings and streams running through the town. We ate good cheapo meal in a restaurant nearby and had another walk. I had to ask the Patron how to turn OFF the gas-fire in our room! I detected a certain COOLNESS in his manner - as we had not eaten in his restaurant. It was hellish expensive! Bed 2330 hours. (Cycled 43 miles). I slept fairly well but awoke early. We had an expensive but good breakfast and left about 0930 hours in cold, sunny weather along very attractive wooded roads. The hillsides are covered in deciduous trees around here. 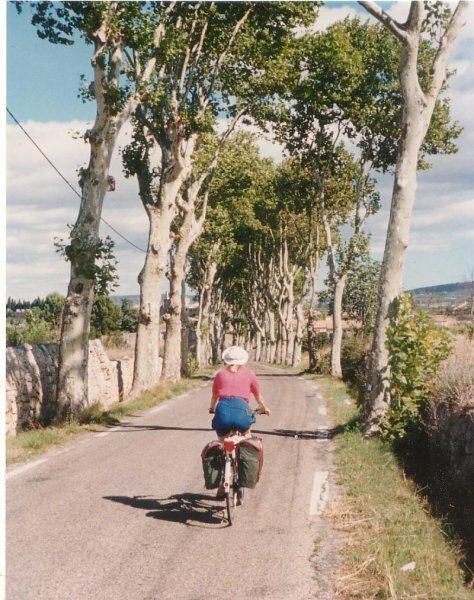 We had to push our bikes up over a wood covered ridge and then we cycled down the other side to Marais de Vernier, a marshy area which was mostly drained and planted with many apple orchards. Finally we reached the Pont de Tancarville. Horrendous traffic and the middle lane was being re-surfaced, so only 2 lanes were open! We had to push our bikes on the "footpath" which was not a footpath and not supposed to be walked on! The huge trucks were nearly hitting us with their wing mirrors. Absolute hell! Finally we got off the bridge and got down below it onto lovely minor roads along Canal du Havre. Cycled for miles along minor roads and away from the petro-chemical works just outside Le Havre. Finally entered Le Havre via the "backdoor" and eventually found the terminal for P&O. The sun came out having disappeared during the morning. We got on the 1545 hours boat for Portsmouth. We chatted to an interesting elderly widow who sat at our table and 2 young women. We arrived in Portsmouth at 2130 hours and eventually checked into B&B at the "Market House Tavern". Had drinks in the pub and bed at midnight. (Cycled ?? miles). I slept quite well although woke early. After a British Standard Breakfast we set off at 1000 hours. Chatted to a South African fellow, who had been in the room above ours. He was hitch-hiking around the world. We cycled to the Ryde ferry, which is "next door" to "HMS Warrior" and went on a catamaran (not a car ferry). Weather cold and damp and we cycled from Ryde to Yarmouth on main roads as we did not have a map of the Isle of Wight but there was not too much traffic on the island. At Yarmouth we caught the car ferry to Lymington. At the railway station we chatted to a woman who had hit very hard times, having had 2 alcoholic husbands followed by an alcoholic and schizophrenic lover. Now she stood up in all the clothes she had, more or less, and was also homeless and pennyless. She was hoping to take a live-in hotel job. She was probably only in her 30's although looked older. We caught a train to Brockenhurst and then a train to Poole. We collected our keys from John's mother who gave us a meal and then we cycled home. On the cycle path from Poole, where the path had been dug up to put in yet another road this time for an industrial site, I had a flat back tyre punctured in 2 places side-by-side! We arrived home about 1700 hours. Compiled, formatted, hyperlinked, encoded, and copyright © 2005, John Palmer, All Rights Reserved.